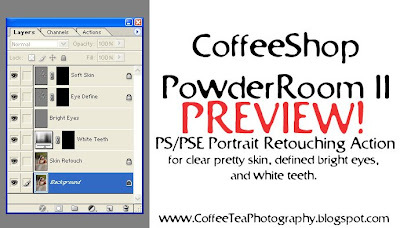 The CoffeeShop Blog: Preview of CoffeeShop PowderRoom II Action! Preview of CoffeeShop PowderRoom II Action! I have finally updated my original CoffeeShop PowderRoom action. This improved version which will run in Photoshop Elements (5,6, and 7) and Photoshop (7 and all versions of CS) is streamlined and has two new layers, one to retouch skin and one to whiten teeth! So you can retouch and soften skin, define and brighten eyes and whiten teeth; all in one action. I am really excited about this action and will be posting the final version this week. I am also including a .pdf file with step-by-step instructions on retouching using this action. Then I will be putting my final touches on CoffeeShop Pretty Portrait which will have the above action plus color pop, sharpen, and vignette; basically a one-action-does-it-all for portraits. I think you guys will love it! Plus I have more tutorials and cool enhancement actions coming out in the next weeks. Thanks again for your wonderful comments, emails and support. You all make it so fun for me to blog here!!! yahoo!!! I can't wait! thanks! yeah me too, I absolutely HAVE to figure out how to get my actions to work or actually SHOW Up in PSE7, I have read and followed the instructions to the letter and have YET to get them to work... maybe i will by the time this comes out!! hi rita. wow. thanks for visiting my blog. great to have some feedback. as you've seen I visit here regularly. I have a link from mine to yours and have encouraged some of my locals to check out your site. really looking forward to this Rita! thanks for ur efforts in advance! can't wait!!!! Love the first one...THANK YOU!!!!! Perhaps you have to delete your mediadatabase file? So looking forward to these actions. I didn't have the originals so have not tried them before. Can't wait to use them. Thanks again for sharing you are a lifesaver! REALLY looking forward to this one! I use your other Powder Room action all the time ! You rock!!! I can't wait to see the final product and to try it out! I am really looking forward to using this action! It makes the photos look amazing! Thanks for all your creativity and willingness to share. Wow! I can't wait to try your feebie actions but somehow I can't figure out how to use them in CS3. I have tried to follow as many links as you suggested including posting a question on flickr, but so far no luck yet. Can anyone be able to give advices to me?